Whether you want to get the latest on what’s happening with Vladi Private Islands, or are simply looking for inspiration for your island stories or TV shows, our chronologically-ordered Press Release Archive contains plenty of information about the topics and trends of the private island market. If you would like us to send the Vladi Private Islands Press Releases directly to your inbox, please subscribe here. From coral-fringed pieces of paradise in the Pacific to rugged retreats in Scandinavia and the wild wooded landscapes of Eastern Canada – private islands can be found in all shapes and sizes, across all of the seven seas. 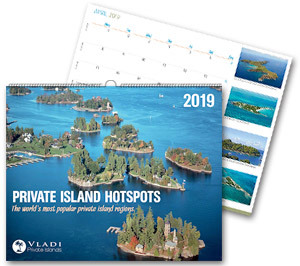 In the 2019 edition of the Vladi Private Islands calendar, Private Island Hotspots – The World’s Most Popular Private Island Regions, we invite you on a 365-day tour of the world’s most-loved island locations. Feed your wanderlust and find out on which island idyll the Vladi Private Islands story started fifty years ago. Sun, sea, sand – and good food! 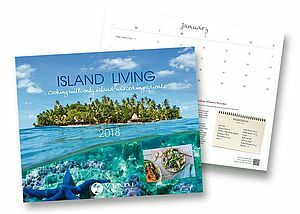 As well as stunning imagery of some of the world’s most beautiful islands, the 2018 edition of VLADI PRIVATE ISLANDS’ annual calendar, ISLAND LIVING - COOKING WITH ONLY ISLAND-SOURCED INGREDIENTS, also includes a series of delicious recipes – all of which make use of healthy ingredients sourced exclusively from the islands themselves. Featuring freshly-foraged fruit and veg, exotic home-grown herbs and spices, the local catch of the day, our sensational, self-sufficient recipes are ideal for (would-be) island dwellers worldwide. Taking in islands in Europe, French Polynesia, the Caribbean, and beyond, this year’s calendar promises to be the tastiest round-the-world trip you’ve ever taken – bon appétit! What could be more romantic than a private island located in the city of love? Situated in the heart of the Venetian Lagoon, just minutes away from Venice, Isola Santa Cristina is available on a strictly exclusive basis, meaning you won’t have to share your intimate island escape with another soul. Prices start from EUR 25,000/week. New for 2017, this Caribbean private island escape is sure to get your heart racing. Offering world-class kite-surfing, wild wakeboarding adventures and much, much more, Eustatia is the perfect island hideaway for loved-up adrenalin junkies. Prices available on request. Boasting a decadent king-sized bed with built-in massage unit, a romantic hot tub and unbeatable views of Boldt Castle, a spectacular heart-shaped castle island, there’s more than a fair share of love in the air at this cosy, all-American private island retreat. Prices start from USD 1,400/night. Known locally as Song Saa – Khmer for The Sweethearts, Cambodia’s first and only luxury island resort is as romantic as the name implies. Perfectly positioned far beyond the tourist trail, this isolated paradise is ideal for intimate island escapes and spectacular wedding ceremonies. Prices start from USD 1,590/night. If you really want to impress your Valentine this year, look no further than this exquisite escape. With sensual spa treatments, romantic stargazing tours, and indulgent tree-top gourmet experiences, we’re sure you’ll fall in love with this six star Seychelles getaway. Prices start from USD 3,700 per villa/night. Christmas is just around the corner and the race to buy the perfect present is well and truly on. If you're still desperately searching for that special something to put under the tree, don't worry - help is at hand. Just in time for Christmas, international island broker VLADI PRIVATE ISLANDS has produced a list of three pristine private islands that prove once and for all that you don't have to be a millionaire to own a private island. Read on to find out how you could make your private island dream a reality this Christmas - for just EUR 30,000-! Covered by dense woodland and surrounded by crystal clear waters, the Sheep Lake Islands are the epitome of Canadian charm. Located in Nova Scotia, just 40km from the coastal town of Lunenburg and 120km from Halifax International Airport, an island here could be all yours for just over EUR 30,000- with the added option of officially rechristening the island with a name of your choice. Naomi Island is located in a river, some 145km to the north of New York City. Situated in the Hudson River region, the wooded island is just 45 km from the mainland and can be easily accessed via boat. 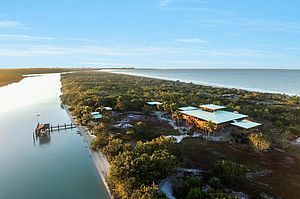 The island is listed with VLADI PRIVATE ISLANDS for USD 99,000-. Located in West Cork, Ireland, Mannion Island is one of the rough diamonds of the northern European island world. 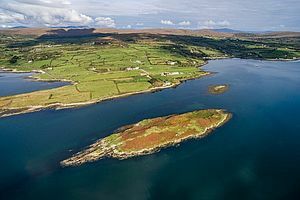 The island can be found in the picturesque Dunmanus Bay, just 200 m from the coast. Undeveloped, but with a natural fresh water source and fertile land to the south of the island, Mannion Island could be all yours for EUR 150,000-. Want to make your island dream come true without purchasing a private island of your own? How about an unforgettable private island vacation? VLADI PRIVATE ISLANDS has a wide selection of private rental islands spread right across the world. For a comprehensive overview, click here. Ever wondered where your favourite celebrities are headed off to on their holidays? Vladi Private Islands’ fabulous new calendar is certain to sate your curiosity. 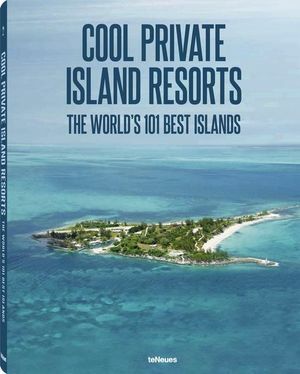 Entitled The Private Islands Most Visited by Celebrities, this must-have calendar affords island aficionados an exclusive glance behind the scenes of the exclusive island hideaways most loved by entrepreneurs, royalty and the stars of stage and screen. From cool Caribbean retreats to sensational South Pacific hideaways and onto intimate Indian Ocean escapes – if a member of the glitterati has visited a private island, you can be sure that it’ll be contained within our calendar. To find out more information about the individual islands, we’ve included a QR code on each page of the calendar. A simple scan of the code will send you directly to our website. From there, you’re only a few clicks away from following in the footsteps of the stars and booking your dream holiday on a private island – whatever your budget may be. If owning an exotic private island in the sun-soaked waters of the South Pacific is at the top of your bucket list – look no further. International island brokers Vladi Private Islands can turn your dream of owning an island in French Polynesia into reality – even on a tight budget. With unspoiled island gems available from just US$ 265,000-, you could become a private island owner for the price of a one-bed apartment! Ensconced within the luminous waters of the Rangiroa Atoll (an hour’s flight from Tahiti), Motu Matatahi is every inch the traditional palm-fringed private island paradise. Framed by pristine, sandy beaches and just ten minutes away from the pure perfection of The Blue Lagoon, this dreamy island idyll could be all yours for approx. US$ 265,000. Comprising just 3.6 acres, Motu Pakirikiri is a pint-sized private island gem tucked away in Manihi – a breath-taking coral atoll within the Tuamotu Archipelago. For approx. US$ 375,000 you could be the proud owner of front row tickets to a wonderful underwater spectacle: as well as countless ray and marlins, you can while away the hours watching dolphins and whales here. Whether you prefer to stroll barefoot along its powder-white beaches or take a nap in the shade of its towering coconut trees, Motu Tohepuku offers the perfect conditions for relaxation. Situated within the Tuamotu Archipelago and just an hour away from the next closest airport, the island is available with Vladi Private Islands for just under US$ 450,000-. Bordered by a luminous lagoon to the north and a thriving coral reef to the south, Motu Karatae is an extra special private island prospect. Comprising almost 25 acres, this exotic island escape could be your future holiday home for just over US$ 470,000-. Or perhaps you’d prefer to get a feel for the fantasy island lifestyle of French Polynesia before going whole hog and buying an island. Vladi Private Islands has got just the ticket, boasting a series of intimate island travel destinations throughout the South Pacific. Motu Tetaraire is a great place to start – an all-inclusive hideaway in the Rangiroa Atoll which offers endless serenity and seclusion. The spacious main house and the inviting guest bungalow could be all yours for just US$ 3,000 per night based on a minimum stay of five days. Book now via www.vladi-private-islands.de. Jim Biden, jüngerer Bruder des US-Vizepräsidenten Joe Biden, und seine Frau Sara verkaufen ihr privates Florida-Refugium Keewaydin Island durch VLADI PRIVATE ISLANDS. Diese Insel wurde gemeinsam mit dem US-Vizepräsidenten genutzt. Keewaydin Island ist etwa 405 ha groß. Die Bidens gehen sehr vorbildlich mit der Natur um – heute sind 403 ha der Insel unter Naturschutz und lediglich 2 ha privat genutzt. Das 372 qm große und komplett renovierte Haupthaus des sogenannten „Biden-Bungalows“ an der Küste vom Golf von Mexiko verfügt über fünf Schlafzimmer, sechs Bäder und eine Küche mit Springbrunnen. Herzstück ist die Mastersuite mit fulminantem Rundumblick auf die Rookery Bay Mündungen, den Golf von Mexiko und die umliegende Natur. Diese ist unter anderem mit Rehen, Wildschweinen, Adlern, Leguanen sowie kleinen Meeresschildkröten besiedelt und Teil des Rookery Bay National Estuarine Research Reserve. Auch das 65 qm umfassende und voll ausgestattete Gästehaus mit einem geräumigen Schlafzimmer sowie einem Badezimmer mit direktem Ausblick auf den Mangrovenwald lädt zum Verweilen ein. Zu den weiteren Annehmlichkeiten des etwa 2 ha großen Domizils zählen ein Pavillon mit Outdoor-Jacuzzi und Fitnessstudio sowie Solarstrom. Vom privaten Bootssteg aus sind das nur gut drei Kilometer entfernte Marco Island und das knapp zehn Kilometer entfernte Naples mit Flughafen leicht zu erreichen. Die schönste Zeit des Jahres wie die Politiker-Familie Biden unter der herrlichen Sonne Floridas verbringen – für USD 5.995.000 könnte dieser Traum schon bald in Erfüllung gehen und die Insel ist die Ihre! Dreaming of an island getaway? With the hustle and bustle of a busy life, and the stress of that major work project pushing you toward a pint of ice cream at midnight, you probably need some time to relax and appreciate the beauty of nature. 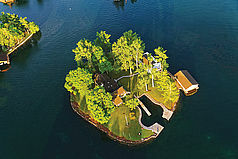 How about a private island for you and your sweetie? Vladi Private Islands and Modernize understand the need for a romantic vacation, so here a few reasons why you should build that island-rental savings account now.Spend Time TogetherIf work or family obligations have been keeping you and your partner apart, spend some time reconnecting and bonding in a breathtaking setting. When you rent an island, you have the whole setting to yourself, uninterrupted by others who have high demands. You can spend time just relaxing and rekindling that love, or even celebrating an anniversary. The absence of distractions will soothe and rejuvenate you. Planning a grand romantic gesture this Valentine’s Day? VLADI PRIVATE ISLANDS has got two extra-special gift ideas which are guaranteed to impress. With our help you could surprise your significant other with either a heart-shaped private island or an extra-special island named in their honour. Treat the one you love to an extra special private island – named in their honour. Our picturesque islands in Nova Scotia are the perfect choice for this unique, romantic gift idea. Canada’s dreamy Atlantic Province is characterized by its picture-perfect coastal and lakeside landscapes. For less than CAD 50,000 you could be the proud owner of one of four beautiful, wooded islands located in the midst of untouched nature. Upon purchasing the island, you can christen the island with a name of your choice and register the new title in the land register. This Valentine’s Day, why not show your special someone how much you care by surprising them with a romantic gift they’ll never forget: a heart-shaped private island! Blueberry Island and its associated mainland property are located just 45 minutes to the north of Montreal. As well as boasting a cosy log cabin, the island also comes with its own sandy beach, a garden and a picturesque forest, perfect for starry-eyed strolls. And there’s more! Blueberry Island is also home to its own cedar-log sauna - the perfect way to unwind and end your day in paradise with style. That's right – whether your budget only stretches to the price of a city-flitter like the BMW Mini or reaches as far a cool classic like the Ferrari 250 GT, CARS VS ISLANDS – 2016 proves we've got the perfect private island for every pocket size. And better still – our islands actually have an advantage over their four-wheeled rivals: unlike your average automobile, the value of an island increases year after year. So if you're mulling over purchasing the car of your dreams this Christmas, it's not too late to change your mind. » Click here to order your copy of the calendar. Situated just off the coast of Copenhagen, Flak Fort is the perfect private island for entrepreneurs - an ideal investment opportunity with an interesting past. Constructed in the buildup to World War I, the island forms one of three sea fortifications designed to protect the port of Copenhagen in the event of enemy attack. Reminders of this former role can be found throughout the island, in the form of underground corridors and gun emplacements. Comprising of 7.6 acres, this fully-developed, recently-renovated island retreat lends itself perfectly for commercial usage and comes with a series of spacious bedrooms, a fully-equipped restaurant/conference room, a kiosk and even its own marina. Indeed, further to its use as a sea defence facility, the island has also been used as a sailing centre and a unique event location. For € 7,500,000 this island could soon be yours. For more information and high-resolution imagery of Flak Fort, please don’t hesitate to contact our Press Department. Remember to copyright Vladi Private Islands if reproducing any images. With its long sandy beaches, its sprawling size and its paradisiacal location in the heart of the Mediterranean Sea, it’s no wonder that Hamburg-based broker VLADI PRIVATE ISLANDS is describing ISLA ESPALMADOR as a "once in a lifetime opportunity." "It's rare to find islands as beautiful as this one on the market. Factor in the prime location – just off minutes away from the coast Ibiza – and its existing developments, and you’ve got a very special property indeed," explains VLADI PRIVATE ISLANDS' president and founder, Farhad Vladi, who has been selling and renting private islands for over 40 years now. A private island that boasts a three-bedroom house, its own jetty and a wealth of natural beauty has been placed up for sale with VLADI PRIVATE ISLANDS - all for just over half a million pounds. Looking for a picturesque private island without a premium price-tag? As well as boasting a stunning collection of luxury islands for sale, VLADI PRIVATE ISLANDS has also got the perfect solution for island hunters on a more modest budget. Gigalum Island (Scotland) is situated just minutes away from the Mull of Kintyre and boasts breathtaking views as well as a unique three-bedroom property and a pleasantly surprising price-tag which places it easily within reach of everyday island dreamers. Listed via Hamburg-based island brokers VLADI PRIVATE ISLANDS,Gigalum Island is available to purchase now for offers over GBP 550,000 – meaning that for less than the average cost of a one-bedroom flat in London, you could be the proud owner of fully-developed 19.3 acre private island. The island, which is located within easy reach of Glasgow and counts some of Scotland´s most enchanting islands (Gigha, Jura & Islay) as its closest neighbours, is also home to an eye-catching house which centres three cosy en-suite bedrooms and a well-sized kitchen around a large, octagonal-shaped lounge. Further development is also possible. In just over a month’s time, loved-up couples all over the world will be cozying up together to celebrate Valentine’s Day. Show your special someone how much you care with the help of VLADI PRIVATE ISLANDS and treat them to an extra special private island – named in their honor. Our picturesque islands in Nova Scotia are the perfect choice for this unique, romantic gift idea. Canada’s dreamy Atlantic Province is famed for its friendly inhabitants, its picture-perfect coastal and lakeside landscapes and the endless abundance of leisure and recreation activities. For less than CAD 50,000 you could be the proud owner of one of four beautiful, wooded islands located in the midst of untouched nature. Currently known as the Sheep Lake Islands, it’s possible to christen the island with a name of your choice upon purchase. You can even register the island’s new title in the land register! You and your partner, stranded alone on a dreamy desert island love nest… we can’t think of a better way to get in the mood for love. Check out our collection of intimate island retreats for a host of inspiring ideas guaranteed to capture your heart this Valentine’s Day and be prepared to fall in love with VLADI PRIVATE ISLANDS’ top tip for romance: Forsyth Island. Promising peace, solitude and a whole lot of sunshine, New Zealand’s Forsyth Island is home to two superb accommodation options: the hillside Te Paruparu Lodge (240 m²) and the bewitching Shorebeach Cottage - located along Forsyth’s fantastic beach. The land of contrasts promises plenty of opportunities for joint activities such as boat tours, hiking, mountain biking or even simply taking it easy in the whirlpool. Celebrate Valentine’s Day with the love of your life on Forsyth Island – did we mention it’s also a great location for weddings? VLADI ISLAND TRAVEL can take you to over 200 island destinations – from France to Fiji and on tot he beautiful Bahamas. For detailed travel information and to book your dream island holiday, either head to www.private-islands.com or contact the VLADI ISLAND TRAVEL Team directly via travel@vladi.de / +49 (0) 40 33 00 00 For further information and high-resolution image material, please don’t hesitate to contact us. Please remember to copyright VLADI PRIVATE ISLANDS when reproducing the photographs. "If you can afford to buy a car, you can afford to buy an island." The favourite phrase of Hamburg-based island broker, Farhad Vladi has attracted a lot of scepticism over the years, but rings a lot truer than you might think? "It`s a common misconception that private islands are the exclusive domain of millionaires and celebrities," explains the VLADI PRIVATE ISLANDS founder. "Whilst we certainly count such high-net individuals to our clientele, you might be surprised to hear that the number of people of more modest means buying islands is on the up." It’s little wonder – for the price of a Volkswagen Beetle you could be the proud owner of a picturesque private island in Canada. Indeed, even when taking into account the property taxes, maintenance costs and insurance fees involved in the purchase, a private island often works out to be a more financially attractive option than a car, and – unlike your average automobile – actually increases in value from year to year. And besides, as Vladi quite rightly points out: "If you’ve got an island, you don’t need a car." It’s a common misconception that private islands are the exclusive domain of millionaires and celebrities – a status symbol out of reach of the average Joe. Such thoughts couldn’t be further from the truth, however. The truth is, it’s possible to make your private island dream come true - whatever your budget! For as little as USD 43,000 you could become an island owner with VLADI PRIVATE ISLANDS. What these low-priced islands may be lacking in luxury, they more than make up for in spirit. The sense of freedom they offer sets them miles apart from more traditional real estate equivalents. Allowing you to get away from the world or take it all with you, these secluded retreats are perfect for nature lovers and water sports fans alike. Modern electricity generators, water-treatment facilities and communication networks mean it couldn’t be easier to develop a new island. With the help of a cosy prefabricated house and an infrastructure project, your new island will soon feel like home. Start your search for the perfect present with VLADI PRIVATE ISLANDS. Just in time for Christmas, we’ve put together a list comprising exclusively of islands costing less than USD 120,000. For a Christmas with a difference, why not surprise your loved ones with the holiday of a lifetime? We’ve got a broad selection of islands still available over the festive period – just perfect for any latter day Robinson Crusoes? 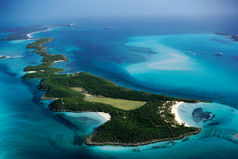 VLADI PRIVATE ISLANDS is embarking on its first ever online island auction. 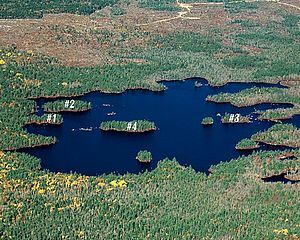 As of August 27th 2014, the picturesque Hurricane Hole Island in Nova Scotia, Canada, will be going under the hammer via online auction house eBay. The auction is set to run for a total of 30 days, giving would-be island owners ample opportunity to invest in the island of their dreams. Just a few days after going live, the bidding has already climbed from its starting price of just US$ 1 to an incredible US$ 10,000. Despite being at the forefront of the private island market for over 40 years now, the online auction of Hurricane Hole Island forms a first for Farhad Vladi, the founder of international island consultancy VLADI PRIVATE ISLANDS. Starting from August 27th 2014, the auction will be open to all via www.ebay.com. Bidding began incredible US$ 1, promising an excellent opportunity for island lovers all over the world - regardless of budget. Tucked away in Isaac’s Harbour along Nova Scotia’s picturesque Atlantic Coast, Hurricane Hole Island was once a popular place to cast anchor – a safe harbour for the local fishing communities. The island also played an important role in the Nova Scotian gold rush of the 19th century and even formed home to a gold mine. These days, the island is covered in dense woodland and boasts a series of beautiful beaches and bays. At low-tide, the island is connected to a nearby mainland peninsula. From here, the well-paved Marine Drive road connects guests to the nearby fishing villages of Goldboro and Isaac’s Harbour before eventually leading on to Halifax (three hours away). Mediterranean private islands rarely arrive on the island market – and when they do, they often have an astronomical price-tag attached to them. With this Greek island gem, however, international island broker Farhad Vladi is proud to present a private island rarity that bucks the trend: Little Lesbos – all yours for EUR 800,000. Available on the international market for the very first time, Little Lesbos forms quite the coup for Vladi, whose company, VLADI PRIVATE ISLANDS was issued with the exclusive mandate to sell the island by owners directly. Blessed with bays, beaches and beautiful vegetation, Little Lesbos also boasts a brilliant location - just 200 meters of crystal clear, tranquil waters separate the island from the sleepy village of Pamfila, with a further 15 minute drive connecting it to the capital of Lesbos itself, Mytilini. Easily accessible via an array of ferry connections or via the island’s international airport, the island of Lesbos has been a firm favourite amongst travellers for many years now, thanks in part to its high-quality olive oil, its fiery ouzo and the beautiful beaches that bring back the tourists year after year. Take an exclusive peek behind the scenes of Hollywood star Marlon Brando’s French Polynesian hideaway with VLADI PRIVATE ISLANDS - official partner to The Brando! After eight long years of careful planning and development, Marlon Brando’s South Pacific paradise is finally ready to open its doors to discerning travellers on July 1st, 2014 –10 years to the day since the Hollywood heavyweight’s tragic passing. Home to 35 energy-autonomous luxury villas – each of which overlooks a pristine private beach and boasts its own plunge pool – it’s easy to see why Hollywood’s most famous names are already clamouring to get on the guest list. Prices start at EUR 3,000 per night and could reach as much as EUR 250,000 per night for an exclusive island buy-out (available by special arrangement via VLADI PRIVATE ISLANDS). Yet whilst certainly not cheap, those in the know assure us this exotic escape is worth every penny. As beautiful as it is beguiling, the Tetiaroa Atoll first captured the heart of the Oscar-winning actor in 1962, during the filming of Mutiny on the Bounty. Three years later, in what Brando declared to be one of the “big moments” of his life, the island was his. Mindful of the Brando’s promise to preserve Tetiaora’s true essence, the resort is very much in harmony with its natural surroundings. Tipped to become the world’s most eco-friendly private island, The Brando forms a fitting legacy to the forward-thinking Hollywood star. For a more detailed behind the scenes look at Brando’s incredible island legacy, please contact VLADI PRIVATE ISLANDS (presse@vladi.de | +49 40 46 00 07-40). As well as rental details and up-to-date price information, we’ll happily provide exclusive, high-resolution photo material. Inspiring fantasies since time began; private islands serve not only as the world’s hottest real estate, but as an increasingly popular travel destination, too. Whether you’re looking to leave the world behind or take the best of it with you, private islands are a dream come true. A selection of the very best of these island escapes will be presented for the first time within the pages of teNeues’ latest publication, due for release in October 2013. Inviting readers on a global journey of a different kind, this high-end coffee-table book promises an incredible island-hopping trip, stopping off at a host of enchanting resorts, sensual spas and sun-drenched beach bungalows. Wander through the resorts of famous island owners such as magician David Copperfield and self-made billionaire Richard Branson or take some time out on the same private luxury island where Prince William and Duchess Catherine spent their romantic honeymoon. Whether you’re hoping to be the king and queen of your own island castle or even enjoy a private hideaway on a self-catering basis, there are islands for every budget – from $100 to $10,000 per day! Please let us know if you require a review copy. We will then pass on these requests directly to the teNeues publishing house. If you are interested in showcasing a particular island, please feel free to either give me a call or drop me a line via e-mail. Whether for a one-of-a-kind wedding, a secluded family gathering or a tranquil corporate event, island getaways provide the perfect remote escape and a truly unique setting. Several islands are still available throughout the festive season, simply head over to www.vladi-private-islands.de to find out which dream islands are waiting to welcome you to their deserted beaches. The following link allows you to download the cover of the title and five other hi-resolution press images (300 dpi). Diamonds are a girl’s best friend? Forget it! This Valentine’s Day it’s all about our oh-so-romantic island escapes. The perfect idea for a unique gift or a passionate private island vacation, these three love-nests are sure to capture your heart! For further information and high-resolution image material, please don’t hesitate to contact us. Please remember to copyright VLADI PRIVATE ISLANDS when reproducing the photographs. 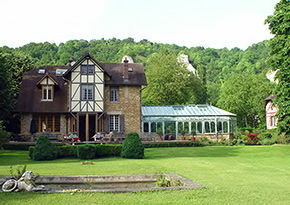 New to the European market - an incredible island in France! Without a doubt the most beautiful island to currently find itself on the French market, the wonderful Île de Boëdic lays protected within the Gulf of Morbihan - a veritable paradise for sailing fans - and is dotted with an array of luxurious buildings, all of which have been renovated in the last two years. 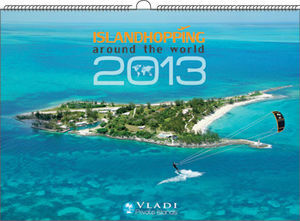 Let Vladi Private Islands take you on an unforgettable journey with our new, exclusive island-hopping calendar. 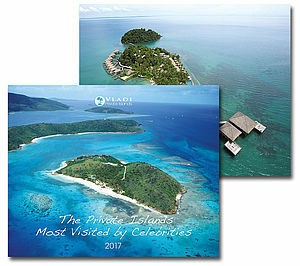 Taking you on a round the world trip over the course of a year, the 2013 edition of the VPI calendar is the perfect gift for those latter-day explorers who want to turn their island daydreams into a reality. Stopping off at a different island every month and with a few special surprises thrown in for good measure, this year’s calendar proves that these days, you don’t need a six-figure salary to join the jet set. With everything from regal resorts to rugged Robinson retreats, there’s an island for everyone on this once-in-a-lifetime trip. So what are you waiting for? Fasten your seatbelts and let Vladi Private Islands take you on the journey of a lifetime. Vladi Private Islands founder Farhad Vladi gives his expert views and advice on the most important new trends that are changing global island market forever. In recent years the governments, Nature Trusts and Nature Conservancy Groups of many different countries have all come forward to buy islands. Indeed, not long ago, a prime island in Nova Scotia was sold for a substantial price to the Nature Trust. A very big change was afoot, however. Unlike previous occasions, where public money was used to secure the deal, the purchase of this particular island was financed by a very prominent local businessman, who donated private money to secure the protection the future enjoyment of this island for the people of Nova Scotia. It is becoming more and more common to see the government of various countries purchasing islands. From France to Scotland and England to New Zealand and beyond, the governments of these countries can be seen making use of the recession to purchase islands for low prices. It is popular move for politicians, who are keen to promote the purchase of islands from private hands into public hands. This conservation trend is almost certain to continue and will be visible almost everywhere except for those islands that already have substantial developments upon them. The British Virgin Islands, for example, has issued a policy according to which the government makes use of their right of first refusal regarding any undeveloped islands which appear on the market. This is very much the trend. Who will be the island owners of the future? In my opinion; it will be conservation-minded public or private island owners, and developers of hotels and resorts. The other trend in the private island market is that people do not want to own, but more enjoy. This new direction has given a considerable boost to the island holidays and island travel market and has made a difference regarding development too. More and more island are developed for short term holidays – whether a resort or privately owned. Many island lovers are asking themselves the following question: why buy and have the burden of responsibility when I can enjoy the exclusivity of an island holiday instead? This way, the traveler even has the right to complain! In the island market there is no such thing as black and white. There are many shades in between. 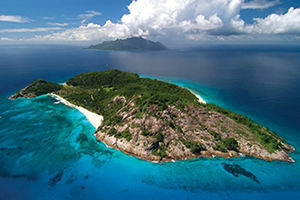 That said, the trend appears to be obvious – the Seychelles D’Arros Island is a textbook example of how private islands are transferring from the private to the public, and is now run by a nature conservancy group. Vladi Private Islands sold it to the emperor family of Iran, who very much enjoyed it, it went to Ms. Bettencourt, who also obviously enjoyed it, and now it is a nature reserve. Great Dog Island in the British Virgin Islands has taken exactly the same path. We, as supporters of private island ownership can assist the island owners with advice about what to do and how to be prepared. Find out whether your island has potential as a resort or a home which can be rented out to island holiday tourists. If neither of this is likely, consider selling now to a nature conservancy group or a government, as long as governments and trusts are paying market value! In this particular case I would also strongly recommend getting a building permit for the island first of all. After all, an island with a permit can be appraised for a higher value. This trend is unlikely to change, as it is already very much in place, is attracting attention and is even supported by several prominent business people. The private islands owners should investigate the highest and best use of their island, look at the trend and reconsider what is the best for the future. A sale to trusts and governments could be the best avenue. Vladi Private Islands can be of assistance to share our experience – we have already been involved in more than 25 sales to governments, nature trusts and nature conservancy groups. Owning a Private Island is definitely a theme which has been discussed more and more in recent years. 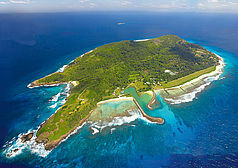 It is no longer a secret that well-known celebrities have bought private islands in the past, as seen by the name-dropping in many island related articles. However, the newest development on this theme is that more and more celebrities are renting rather than buying private islands. • Kylie Minogue stayed on Taprobane Island, Sri Lanka, while recovering from cancer. After the visit she produced a song, entitled "Taprobane (Extraordinary Day)"
These guests appreciated our discrete and secure service. The trend is: Celebrities are not buying anymore they are renting, because this gives them the freedom to change location every year. Are celebrities giving up the island lifestyle? VLADI PRIVATE ISLANDS has been enjoying great success in China: Our representative in Shanghai, Manuel Brinkschulte has sold and closed his first private island transaction!Further we have received extraordinary positive response from many interested clients and we are organizing numerous island viewings worldwide. 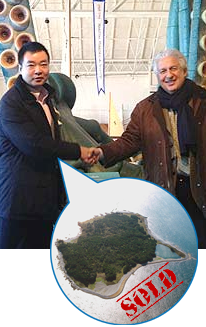 Our client, Bruce Li, purchased a coastal island in Nova Scotia, Canada. Governments and NPOs Acquiring Private Islands worldwide! The iconic island of Ailsa Craig off the western coast of Scotland has come on the market. Located in the outer Firth of Clyde, 16 kilometres off shore, this huge private island with its state-owned lighthouse, is the most conspicuous landmark in the channel between Scotland and Ireland. VLADI PRIVATE ISLANDS has been mandated by the owner, Lord Ailsa, to sell this special property in partnership with Knight Frank. Ailsa Craig Island is also home to the world’s best-known curling stone quarry, and is a sanctuary for gannet seabirds. Sanda Island. This 350 acre island is located on the Scottish west coast off the Mull of Kintyre. Sanda Island is a privately-owned island and is indeed unique, as the ownership includes the title "Laird of Sanda", the right to issue its own postage stamps and to mint its own gold coins. Furthermore, the island offers the new owner a self-sufficient life, as it comprises a self-contained hill farm and has an additional income with a popular Bed & Breakfast business, as well as cottages for rent. The island’s own picturesque lighthouse is perched on a high rock and is still in use today. Three years after the sensational success of Pirates of the Caribbean the sequel, full of action, suspense, fun and most of all pirates is now coming to cinemas all across Germany. American actor Johnny Depp, who plays Captain Jack Sparrow, just recently bought a private island in the Caribbean, where he is most definitely not in danger of plundering pirates! The private island Little Hall’s Pond Cay is located in the Bahamas and has been developed. We offered this island for sale on our website www.vladi.de and would be more than happy to provide high-resolution photos by email. American actor Nicolas Cage also owns a private island in the Caribbean after purchasing the as yet undeveloped Leaf Cay Island. He too bought the island from the Hamburg island broker, Vladi Private Islands.